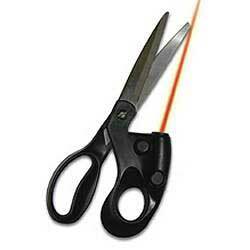 Cut straight every time with these unique, high-quality Laser-Guided Scissors. The built-in laser pointer gives you an absolutely straight guide line to cut along. Two adjustment screws allow you to aim the laser light perfectly. Uses two button cell batteries, included. Not a toy. Keep out of reach of children. Avoid direct contact with eyes.